6.1 The Dark Side of MOOCs? 6.2.2 Videos: Watch about MOOCs? At present, this information is presented in alphabetical order. It may be reorganised at a future date. Deciding how to arrange the information is, in fact, a challenge in itself. An equally valid way of doing so, for example, would be to categorise the various types of CPD into Formal and Informal. The former would refer to that undertaken in the context of work, or as part of an accredited course, while the latter would refer to professional development taken in one's own time or not as part of an accredited course. Unfortunately, real life is rarely so clear-cut: some schools have experimented with Teachmeet-type events on their official training days, and some "ordinary" events are designated as "CPD-approved", meaning, one suspects, that delegates receive a certificate of attendance. Another consideration is that listing these various types of CPD conveys the impression that they are mutually exclusive. However, several would occur from having and participating in a personal learning network (see below). Online Teaching Communities In the video, Leon talks about adding things to the timeline -- he is referring to the timeline in Storify. Also, although Leon advocates using a smartphone or tablet, because they are personalised and can be taken everywhere with you, he agrees that you can, of course, use a desktop computer too! If you have any views as to the most useful way of organising these notes, please make your suggestions in the Discussion section. "Teachers have always been highly creative,creating a wide range of resources for learners. As new technologies become increasingly prevalent, they will increasingly need to be able to digitally ‘stick and glue’. To achieve this, teachers will need to develop and share ways of using new technologies – either through informal collaboration or formal professional development. But they cannot be expected to do this alone. They need time and support from school leaders to explore the full potential of the technologies they have at their fingertips as tools for learning. School leaders can further assist teacher development by tapping into the expertise available in the wider community." Some people maintain a blog not primarily for public consumption but in order to organise their own thoughts and learning. In that situation the writing of a blog is serving a useful CPD purpose. One might ask, "Why do so in a blog, as opposed to a private notebook?" The answer is probably twofold. First, the blog can be updated any time from anywhere in the world. Second, by opening the blog to comments, the blogger is able to find out how other people are thinking about the matters being written about. In effect, the blogger is using his or her audience as a sounding board. Not so much authority as measured by search rankings, although that can be a useful indicator, but their standing in the community of the area about which they write. This could, of course, be extremely niche. For example, if you wanted to learn about the pros and cons of using mobile phones in the classroom, it would be a good idea to read blog posts about it written by people who have tried it. Leon Cych in his video (above) considers the writing of blogs to be a form of CPD inasmuch as doing so can pull together things one has learnt by attending TeachMeets or taking part in online discussions. A blog carnival is a collection of links to blog posts on a particular theme. A recent example is Mathematics and multimedia blog carnival. A blog carnival can be organised very easily, by inviting people to write a blog post on the designated theme, and to provide a link to it. This is what Danny Nicholson did in January 2012 for his Ed tech blog carnival. An alternative approach is to use a blog carnival service, such as Blog Carnival, which both helps with the administration of the carnival and makes it easy for people to find the carnival. An important point to note about blog carnivals is that the individual blog posts are published on the bloggers' own blogs. Thus visiting a blog carnival can be a good way of discovering blogs which one may otherwise not have come across, as well as being a useful source of several articles covering different aspects of a particular theme. People who host a table discussion can also participate in discussions hosted by other people. Delegates could attend either 5 or 6 discussions on a particular theme, such as literacy, or attend a ‘mixed bag’ of topic discussions. Here are details of a project I’ve been running; how do you think it could be made better, or scaled up, or used elsewhere? Here are a couple of apps I’ve found useful; what apps have each of you found useful, and why? I have a bee in my bonnet about X, and would like us to thrash out the issues. I have a theory, and would like to find out what other people think about it. In October 2012, Load2Learn ran a specialist C84C-style event called C84C: Collabor8 4 Change in Inclusive Technologies; not only was this a variation in the sense of having a particular focus for the whole event, but also in that it featured "Lightning Talks". These are seven-minute talks given in rapid succession. This is a specific type of short presentation, in which presenters have five minutes to talk. They are accompanied by a PowerPoint (or similar) presentation consisting of 20 slides, each of which is shown for 15 seconds, before the next one automatically takes its place. See also Pecha Kucha (below). This is a type of seminar in which topics on a particular theme are discussed both by people physically present and via videoconferencing (usually through a platform called Flashmeeting. They were devised by Mirandanet, a community of practice comprising both academics and teachers as well as education consultants. These are Massive Open Online Courses, a coin termed by Dave Courmier in 2008, according to an article entitled Massive Open Online Course in Wikipedia. (It is worth consulting the article for the list of references.) The word "massive" indicates that large numbers of people can participate, while "open" suggests no registration fee. There is a growing debate in the UK about the status and place of MOOCs, because there appear to be two types: genuinely open ones based on a constructivist learning model, in which participants learn from each other, and university-run ones which have been categorised by some members of the education technology community as being, in reality, business models, based on an instructivist approach, ie participants learn mainly from a tutor. Peter Sloep has written about these two kinds of MOOC. A recent post by Sloep, entitled MOOCs, what about them?, advises the educational community to continue to experiment with MOOCs, but to be wary of developments by private, commercial interests. The main debates about MOOCs are taking place in Higher Education. However, the basic idea of a MOOC: an unlimited number of people taking part in a course online free of charge -- can be, and has been, applied outside HE. There is no reason, either, why a school or group of schools could not run their own MOOCs on particular topics, using Google Docs and Google Groups to manage the discussions. For a list of MOOC providers which are not confined to HE see the MOOC Directory, and look out for announcements in Twitter lists and other online discussion fora. Coursera now provide MOOCs specifically for teachers. The Dark Side of MOOCs? According to an infographic called The dark side of moocs, the benefits of MOOCs are open to question. Among the reasons cited are poor access to one's professors, possible poor quality of assessment as a result of a peer assessment model used in some courses, and very low completion rates. Still, even though the source of the infographic may reasonably be seen as being biased, the statistics and viewpoints cited are worth considering in any discussion on the subject. A MOOC (a massively open online course) is a model for delivering learning content online to virtually any person who wants to get to know any course they want without making a payment to the institution providing it. MOOC platforms usually partnered with universities whose professors provide range of courses for hundreds of thousands of students online. Purely online course material delivered via distance education platforms without any tuition fee to anyone anywhere in the world. Courses generally do not have any prerequisites and many of the providers are the top universities around the world, including: Stanford; Harvard; MIT; Berkeley, and so on. Learners can be anyone, from any age group and they can register any course they want without considering educational background they have. They do not need to be a university student who is studying computer science to be enrolled in programming courses for example. It is massive because hundreds of thousands of student can enroll to the same course at the same time. It is open because anyone in the world can enroll to any course they want without depending on the educational level that they have. While some courses also make use of Open Educational Resources (OER) this is not the case for all moocs. It is online because all learning content delivered purely online virtually to any one. It is a course that provides any information that learner need from computer science to philosophy. Some people question whether all moocs can really be described as 'massive', 'open', or 'courses'. This is for various reasons included the size of the course, the placement of prerequisites on entry, and the question regarding the nature of a 'course' versus the content delivered via a mooc. There are two leading providers of MOOCs in the US. Coursera and edX. Coursera It is for-profit educational company founded by computer science professors from Stanford University that offers more than 30 courses for almost 2 million users from all around the world. EdX It is a non-profit start up from Harvard and MIT and Berkeley, launched in fall 2012. On 14th of December, 2012 people in the UK woke up with an excited initiative by The Open University. UK's first MOOC platform Future Learn took place in the news. Futurelearn (led by the Open University). It will be launched in January 2013. In 4 minutes What is MOOC? MOOCs in 4 Mins. The role of moocs in education is contested. Some argue they will open up learning to the masses, while others raise the concern that they may create a two tier higher education system. Furthermore, concerns have been raised regarding the pedagogic value of moocs, and the means with which mooc providers can deliver effective and secure assessments. Similar to Ignite (please see above), Pecha Kucha is a form of short talk in which the speaker is permitted a total of 20 slides, each being displayed automatically for 20 seconds. The talk lasts just over 6 minutes. Pedagoo is a growing online community of educators who aim to share their practice and ideas positively and professionally. 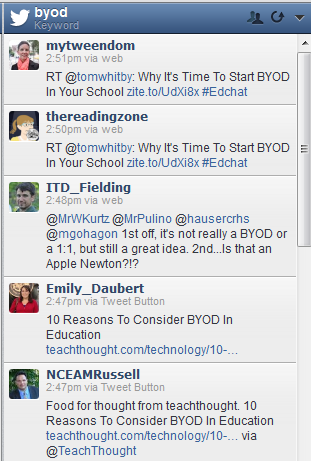 This community has arisen from the education blogging, twitter and TeachMeet networks. It began life in Scotland but is spreading more widely. Pedagoo currently provides three primary ways for community interaction. Pedagoo.org is a Wordpress/BuddyPress site which hosts a collaborative blog and discussion forums. Educators can sign up and write blog and/or forum posts to share their practice or discuss ideas. #PedagooFriday is a weekly hashtag which is promoted by the Pedagoo community. Educators are encouraged to share the highlight of their professional week with the hashtag #PedagooFriday. 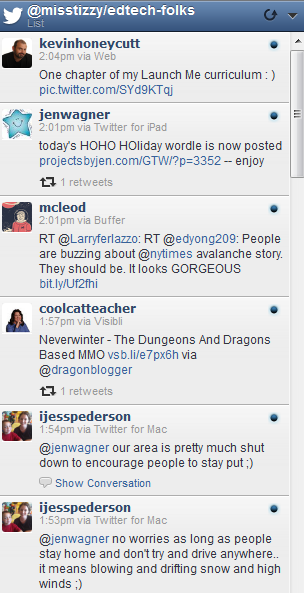 A selection of these tweets are chosen by a member of the community to post on pedagoo.org. Pedagoo has a presence on twitter also: @pedagoo. The Pedagoo community also host offline events. These include the TeachMeet Scottish Learning Fringe in Glasgow, the Pedagoo Xmas Party in Newcastle and smaller locally organised events. "What does a motivated group of self-learners need to know to agree on a subject or skill, find and qualify the best learning resources about that topic, select and use appropriate communication media to co-learn it? In particular, what do they need to know about peer learning?" In many respects this appears (at a cursory reading) to offer little that is breathtakingly new. However, the overview of peer learning is worth reading because it draws together several concepts, including Personal Learning Networks, metacognition and Csíkszentmihályi's "Flow" (although this isn't named as such), with references, and is highly engaging. This may be a useful starting point for a group of teachers wishing to adopt a DIY model of CPD. An approach which appears to be popular is what might be called structured do-it-yourself CPD. This is where the participants work according to a series of challenges. This is especially prevalent in the field of writing, but has found its way into education as well. These are clearly intended to be followed by the participant for a month, with a new challenge being posted each day. Digital Writing Month, which included a challenge for participants to create a 50,000 word novel in 24 hours, in a Google document. Mark Wagner has a useful summary and set of suggestions in his article Personal Learning Networks for Educators: 10 Tips. Would-be speakers enter their name and proposed topic on a wiki. Presentations are either 7 or 2 minutes long. Speakers are selected at random from the list of names. There is usually a "back-channel" via a Twitter hashtag for the event. Teleconference link with another TeachMeet going on at the same time. Teachmeets are usually sponsored by organisations, such as in the form of money to cover some of the cost of refreshments or prizes for the raffle. A lot of expertise disseminated in a relatively short time. People have commented on the fact that they have felt "talked at" for an entire evening. If there are more people who have put their name down to present than can be accommodated in the time available, not everyone who wishes to present, and who may have prepared a presentation, will be able to do so. Unlike an ordinary conference or Collaborate for Change (see above), the audience does not know what topics are going to be presented on. Librarian TeachMeets. See, for example, TeachMeets: Librarians Learning From Each Other, an interesting paper containing some evaluative data. TeachMeets with a particular theme. See, for example, Reflections on TeachMeet for Special Educational Needs. TeachMeets organised by students (Digital Leaders). See, for example, TeachMeet … Digital Leaders style. School-based TeachMeets. These are for staff in-service training for the teachers within a particular school. See, for example, Jamie Portman's Showcasing and sharing classroom practice: School-based Teachmeets. "The aim of TeachMeet Twist is to make sure that everyone attending plays an active role throughout the evening. We also hope that attendees will take the opportunity to network and meet other educators with similar interests to them. By tweaking the usual TM format we hope to include more teachers in discussion throughout the evening and therefore receive a greater variety of ideas." The agenda included both presentations and discussions. There are clearly similarities between TeachMeet Twist and Collaborate for Change (see above). TeachMeet Takeover. This is version of TeachMeets that has taken place at the BETT Show in recent years, whereby short presentations (around 15 minutes) are given at scheduled times on exhibitors' stands. From the attendees' point of view, it is a short and convenient "snack" of professional development. Presumably the advantages for the exhibitors are (a) it provides an opportunity for them to make a further contribution to the community by providing space and time within the main show, and (b) it encourages people to visit their stands. Other facilities such as a whiteboard, a facility for uploading and showing PowerPoint (or similar) slides, and "projecting" the presenter's desktop to particpants if required (eg to show a website or a program). If the session has been set up to do so, it will automatically record everything that goes on in the session, ie the presentation, discussion and backchannel, and will generate a unique URL for dissemination to others. Twitter is what is known as a microblogging service, meaning that messages are restricted to 140 characters. Although it is still viewed with suspicion by some as a pointless and time-wasting activity (a perception created or at least reinforced by people who insist on "tweeting" what they are eating for breakfast), it has proven itself to be a valuable tool in the teacher's CPD toolkit -- with an emphasis on the "Continuing" part of 'CPD'. It is easy to pass on useful messages by "Retweeting" them. By following people who work in your field, you can easily, or more easily, keep up-to-date with current developments. The same can be achieved by joining lists (see below). Twitter chats are online discussions which take place according to a schedule, based on a particular theme or hashtag. For a list of Twitter chats see the Twitter Chat Master Schedule, The Top 50 Education Twitter Chats and Leon Cych's video about Online Learning Communities (above). The schedule for the events are unique and fast paced. It was the intention of Jeff Pulver [the originator the 140 Conference] to provide a platform for as many people as possible to share their thoughts and engage in conversation with the attending delegates. You will find individual talks set to: 10 minutes; “Featured talks” 15 minutes and the various panel discussions are set for 10 to 20 minutes. Webinars are presentations or seminars that are transmitted over the internet using real-time communication. They are used quite frequently by companies, seeking to promote their services. For example, a company which provides wireless networking may run a webinar on BYOD, which will be free to attend for anyone who registers online. The presentation will typically include case studies featuring the product or service in question, as well as information about BYOD itself. At the end of the webinar, participants will almost certainly be asked to complete a short survey indicating whether they are likely to be considering an investment in wireless infrastructure (to continue with this example) and whether they may be contacted by the company. Interaction with the presenter tends to be via a chairperson when the talk finishes and question time is announced. Interaction with other participants is absent. This is in contrast to TeachShares (see above). However, it should be noted that the extent, nature and timing of any interactivity involving the participants is determined by the way the webinar is set up by the organisers; it is not an inherent feature of webinars. This page was last modified on 2 May 2013, at 09:37.